Includes: Digital download of two 90-minute training programs, modifiable forms and checklists. Of course, attorneys don’t like to think in terms of marketing and sales. It’s “unprofessional”. But the reality is, you can’t practice your professional skills unless you get clients to engage you and pay you - - the stuff they didn’t teach you in law school or in continuing education courses! How to train your referral sources to properly prepare clients so almost all do business with you - - what they should say and, more importantly, what they should not say! The 2 critical “missing link” steps between setting the appointment and seeing the client that most attorneys overlook (or their staff botches)! How to put both your head and your heart in the right place as you enter an initial meeting, so you’re confident, less anxious, and more successful. The successful meeting “Tool Kit” you should have at your fingertips during every initial meeting (you’ll even get 7 of those tools with the call!). What are the 2 key reasons most attorneys fail to close clients at the initial meeting and how to overcome them. Step-by-step, exactly what agenda to stick to and what to say throughout the meeting as you work seamlessly towards the “close”! How to blow away the 2 most common objections most prospective clients have about moving forward! How to flush out the time waster, do-it-yourselfer and engineer type - - and turn them into an obedient client! How to throw in an irresistible incentive so the client will make the decision to do business right now! How to use the “silent pause” to incredible effect! If you still haven’t closed the client, how to properly and successfully use the ultimate weapons - - the “Columbo gambit”, the “Takeaway” and the “Nucular Bomb”! The one thing to be sure to give every prospect who leaves your office saying “no” - - that will often lead to a “YES”! The 2 simple contacts with “no-closes” after the meeting that will turn them into clients! If you don’t know even just one of the techniques and key components listed above to successfully hold client meetings and engage more clients, then there’s room for improvement. The good news is you don’t have to learn all of this on your own. All of the training and tools to help you successfully hold your initial client meetings and handle objections better is now available in our Successful Initial Client Interview & Appointment Closing Tips Training & Forms Package. Click the “Details” tab to see what’s included. 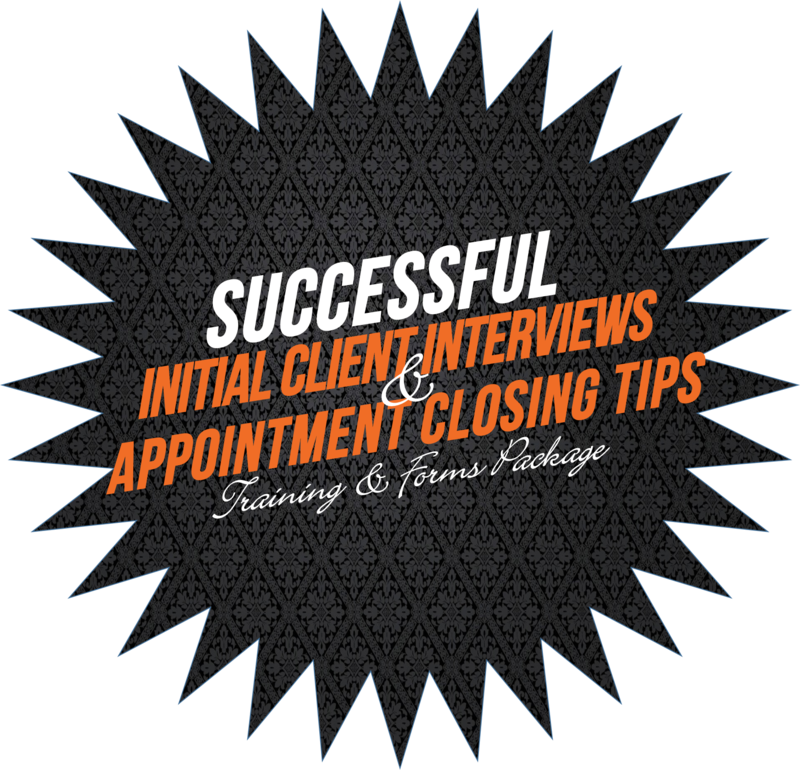 What’s Included in the Successful Initial Client Interview & Appointment Closing Tips Training & Forms Package? Engagement Letter – Engagement form authorizing the legal representation of a client, laying out the date of completion, payment due upon signature and payment due upon the signing of the client’s estate planning documents. Acknowledgement of Information Given – Form releasing liability of you and your law firm should a client or prospective client decide not to move forward with all or part of your planning recommendations. Agreement to the Presence of Others – A waiver of liability for the request of third-parties to be present at the client or prospective client’s meeting, such as a client’s child or other advisor. Friends & Family Disclosure – Disclosure of representation of other family members and friends, plus a disclosure to husband and wife clients of potential conflict of interest. Checklist When Reviewing Another Trust – An internal checklist used when reviewing a prospective client’s existing Living Trust drafted by another law firm. Divorce Checklist – An internal list of the possible estate planning actions to take when a client is currently undergoing a divorce from a spouse. Requirements for Meeting with an Attorney cover strip sheet to serve as a checklist for your prospective client about what’s needed for the initial client meeting. Coverpage of Instructions and Directions so that your clients know where they’re going, when and what to bring with them. Client Questionnaires, including three different versions for prospective clients who don’t already have a Living Trust, for a prospective client that already has a Living Trust, and for existing clients. Confirmation Script so that you and your staff can know, word-for-word, what to say and how to handle the confirmation calls to for all kinds of appointments. Prospect Follow-Up “Sale” Letter - - a unique sales tool to help you close a few more of those prospects that decide not to move forward after the first meeting. The forms and questionnaires come in a modifiable Microsoft Word format for you to be able to easily modify, and edit for your firm. If you have purchased this product and would like to leave a review for others, please comment below. View an alphabetical list of all products and select any product to view more information.